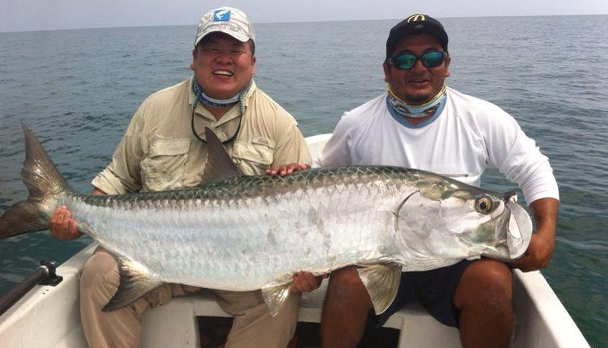 A destination for all lovers of the "Silver King" (baby and giant Tarpon), where you also find Permit, Snook, Sea Trout, Spanish Mackarell and other tropical varieties. A fisherman island where you will be surprised for its natural beauty and the local food based on lobster or fresh fish of the day!!! 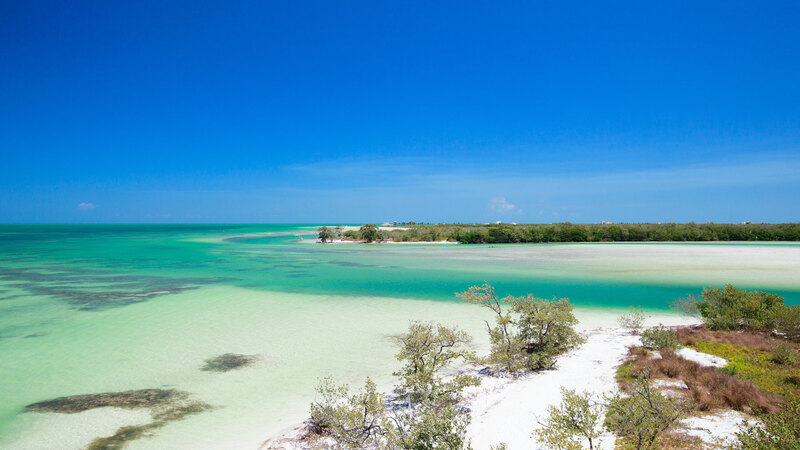 Holbox is a typical island of fishermen with a population of about 1000 inhabitants and a growing tourist activity, specially europeans, canadians and americans looking for tranquility and the taste of unknown and quiet destinations. Holbox village is picturesque, with its colorful low buildings, sandy roads and friendly people. Most of them descend from the Mayas but many come from immigrants from Europe and other countries. Small stores where you can find a bit of everything, restaurants with few tables and good service serving traditional Mexican dishes along with fish and lobster at a reasonable price. Located northwest of Cancun, Holbox touches both the Gulf of Mexico and the Caribbean Sea. That is why it is home to an important amount of marine life making the anglers achieve excellent results. The island is long and narrow; the northern and southern coasts are the longest and, in several parts, they are joint by natural channels or caños, as the local people call them. Most of the northern region has white sand with mangrove forests in some sections and such a clear sea perfect for swimming; while the southern region is more muddy with an irregular shore, more greenish waters and a vast variety of birds. 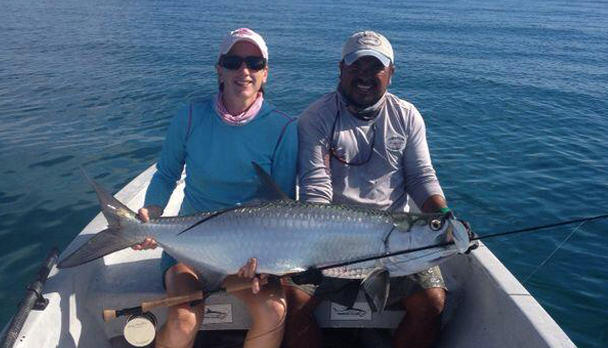 On the island there is a wide range of fly-fishing species but the main star is the tarpon. You find a healthy stable population of baby tarpon all year round and from April through September the giant tarpon start to appear weighting from 150 to 200 pounds. Depending on the time of year you can also fly-fish permit, jack, spanish mackarel, snook, sea trout, snapper, among others, along with the tarpon. 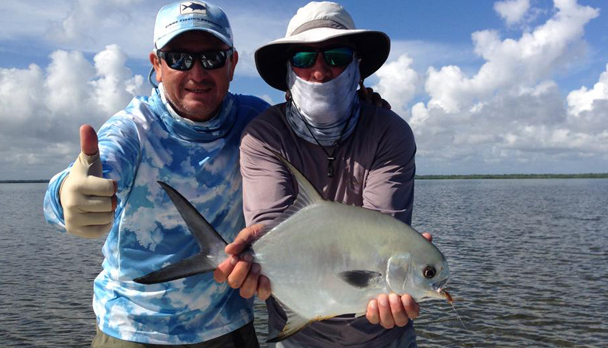 There are few well-qualified fly-fishing guides in Holbox. It is important to keep this in mind so as to make the reservations in advance to avoid mistakes. The package we are offering includes 4 full fishing days with the best-qualified guide on the island and transfer Cancun/Holbox/Cancun. 4-night accommodation in a picturesque hotel in the area. Breakfast and lunch are included, but dinner and other extras are not. You can have dinner at one of the small local restaurants that serve locally caught fish of the day and lobster. Tackle for this fishing includes one #8 Wt and another #9 Wt or #10 Wt rods for the time of year where there are no giant tarpon. 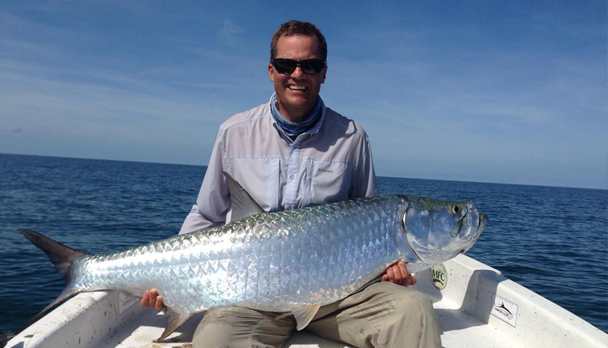 During the giant tarpon season you will need a #12 Wt or #14 Wt. In case you don´t have one, there are rods for rent at U$S 25.- a day. Tarpon flies cost U$S 5.- each. High-performance reels with a good brake system are required, as well as "bimini twist" tarpon leaders or other 80-pound "shock tippet" or over. For the rest of the species, 10-foot 12-pound leaders (preferably fluorocarbon ones for permit or bonefish) or steel tippet for snook or sea trout. Tarpon flies should be tied in hook 2/0, 3/0 or 4/0 and for Giant 5/0 or 6/0 using Balck Death, Purple Death, Cockroach, Stu Apte, Seducer or other varieties in black and red, black and yellow, grizzly, etc. The most effective flies among permit are crabs in different patterns and versions, tied in hooks that shouldn´t be too big and small hook eyes (they shouldn´t be heavily weighted), coffee, brown, sand and with long legs. For the rest of the species, Clouser Minnow in different colors and sizes and streamers are used. Also take a saltwater floating line and an intermediate line for tarpon. We recommend taking a good pair of polarized sunglasses, light shirts and trousers (Columbia, Exofficio, etc), sunblock SPF 40 or higher, a cap with neck protection and insect repellent. Rates include: Transfer Hotel/Marina/Hotel, 1 full fishing day for 1 or 2 anglers, lunchbox, beverages, skiff with professional guide and fishing license. Rates do not include: Fishing equipment and flies, personal insurance and gratuities. Nice days though windy, with very active days, landing mostly juvenile and babies in mangroves. Some snook were landed as well.